Be prepared - you may have to wait for several months for your special puppy. Shibas have very small (1-4) litters, and waiting lists are the norm. RESEARCH the breed - do not rely on cute photos on social media to influence you (yes, we know that is hard). THINK about why you want a dog, and this breed in particular. Do not use the word 'cute' in your reasoning. CONSIDER your life style and living arrangements - are you really prepared for the time, effort and cost? 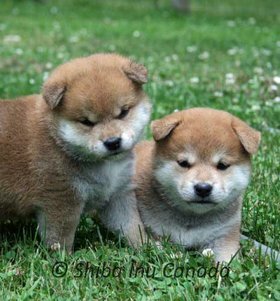 The above link are Shiba Inu Canada members in good standing. The Club takes no responsibility for claims or contract agreements. The Club strongly urges potential owners to fully research both the breed and the breeders. Many people do not realize that their local pet store does NOT get their puppies from 'good local breeders' - far from it. The pet store puts in an order, and a wholesaler (the biggest one is Hunt Corp out of the US) ships puppies supplied by commercial breeders across the US. The on line puppy mills may have a very professional website, with lots of puppies posed in front of curtains with bows & toys. Check carefully - are there several different breeds? Do they crossbreed? Are there health certifications (ie OFA, CERF) for the parents? Are the puppies registered with either CKC (Canada) or AKC (USA)? While you may 'only want a pet', registration is the only proof that a puppy is indeed the breed you are looking for. Fortunately, there are not large numbers of Shiba Inu requiring rescue in Canada. If the Club is advised of one in need, we are happy to post information on the website. There are several organizations devoted to rescue work; please check the Links page. Also the Petfinder site lists a lot of dogs, be prepared that breed identification is not very accurate. Do not be afraid to ask questions of the breeder. If possible, visit in person. Shibas are spotless, there is no excuse for filth. The dogs should be happy and active. Watch how the dogs respond to humans - they should be interested, alert, and keen to have attention from their breeder. Some will be more standoffish, and do not offer attention to strangers. Do NOT "rescue" a puppy from a pet store. While it is heartbreaking to walk away, for every puppy bought, 3 more are produced to supply the demand. The pet store puppies are produced by commercial breeders, solely for profit, with no regard to health, temperament, or genetic screening and least of all protecting the breed. Price varies from region to region, and from breeder to breeder. Be prepared for prices from $1000 to $2500. Be aware that ANY dog sold as purebred must have Canadian Kennel Club registration papers provided to the new owner, at no extra cost. Written contracts should be signed by all parties, with terms and conditions clearly defined. The breeder should ask questions of you, too. Lifestyle, living conditions, expectations of a dog; all help to ensure that the puppy is going to families that are well prepared for the unique little package named "Shiba"! How big is a Shiba? 14" - 16" at the shoulder, 18 - 25 lbs. Yes, twice a year. Thick wooly undercoat is shed in the fall and spring, and it is messy. NO. While not as bad as some breeds, sensitive individuals may experience allergic reactions. YES. They are very intelligent and learn quickly. However, this does not mean they are obedient! Social training is easy, formal obedience training can be a challenge, particularly the off-leash work. Do they need a fenced yard? YES. Shibas were bred to hunt - this meant running all day. Fences should be at least 4' high, with no spaces of more than 3". If they can get their head through a hole, the rest of the body will follow. Are they good apartment dogs? Generally NO. When young, Shibas need exercise, and lots of it. If confined in a small apartment all day while the family is out, a young Shiba will bark, chew, and do all those awful things dogs do when they are bored. If someone is home most of the day with them, and there is the opportunity to get outside for exercise several times a day, Shibas can manage nicely in an apartment. What kind of health problems are there in the breed? At this point in time, the Shiba is generally a healthy dog. The most widespread problem is likely immune related issues (itchy skin, allergies, etc). Hip dysplaysia has been reported - reputable breeders X-ray their stock to reduce the incidence of this. Slipping patellas, some eye diseases and heart problems have also appeared, not in large numbers, but enough that breeders need to be aware and screening their breeding animals. Surprisingly good... but remember that this is also an individual personality trait - not ALL Shibas may accept ALL cats. If a cat runs, a Shiba will chase it. Are Shibas good with children? YES, if they are raised with kids that treat animals with respect. If they have not been exposed to children when they (the puppies) were very young, they may be very apprehensive around children, particularly toddlers. Patience and pleasant experiences with children are the best teachers. there is that shedding thing. they need LOTS of exercise, particularly when young. owners need LOTS of patience, particularly when young (see above!). they can be stubborn, and ignore you, much like a cat would. if they get loose, they may be gone for days, if they can avoid getting hit by a car or attacked by other dogs. there is that superior attitude - owners must possess just as much, if not more, self-esteem than the dog.